The Christmas season is one where the dogs and I relish the break and spend more time on the mountain. There are fewer flowers as the fynbos battens down the hatches for the onset of summer, but there is always something. After a dry winter and as the season gets ever drier, regular friends fail to appear. 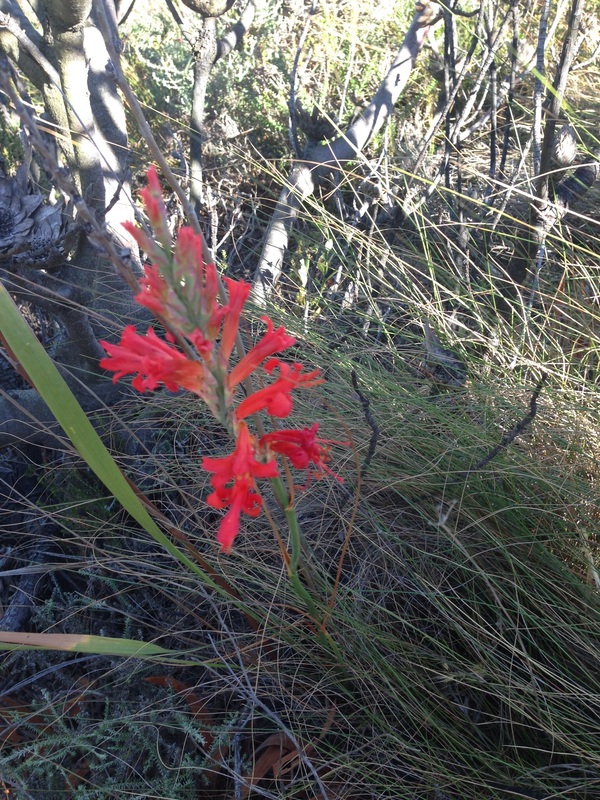 I caught a flash of red on the drive as we drove out the other day and smiled to myself thinking “great, the Tritoniopsis triticea is in flower, we’ll catch lots of them on the mountain on our next run.” Not one so far, not even one. Perhaps they will appear later in the month but already I know they won’t be as profuse as usual. We did come across the charming Micranthus alopecuroides, the “comb flower”. It’s easy to miss because it’s quite tiny, and quite rare too, but we often find a few at the bottom of the drive around Christmas time. Meanwhile our crops are winning the battle – the buchu is hardy and drought resistant and the olives are better this year than they have been for the last couple, largely, we suspect, because we had less wind during the crucial spring flowering season. Talking of wind, a friend came to stay the other night and woke up expecting to see devastation from the storm she’d heard howling around the house during the night and surprised that everything about the place was dry. No, we explained, laughing, that was a normal night wind in summer, not even a big one. El Nino is the culprit of course and these cyclical droughts are normal. It’s our first since being on the farm though and it’s quite chilling to see how the stream, which we believe to be permanent, has slowed to a trickle and our raging waterfall is a pathetic drizzle. The dams below us empty at a worrying rate and the farms in this valley will be glad when the harvest is in. Peter is reassuring and reminds me that “this is Africa.” He has lived through long multi-year droughts in the low veld. We must all hope for a wet winter this year, but before we can even begin we must get through the summer. Fires is our big fear – there was a huge one far from us on the other side of the Franschhoek pass on St Stephen’s Day (Boxing Day to the non-Irish) and the clouds of smoke covered the entire peninsula, flooding with colour at sunset. I have neglected this year to take up the challenge of the yellow daisies They are the hardest to identify and I have been lazy. Here goes…. To start with the prickly bush thistle, which we first saw out running in July, Cullumia setosa. Next comes the distinctive Cape Weed, Arctotheca calendula which also flowers from July to November and we see it all the time, all over the farm. Another one flowering everywhere from the beginning of spring to early summer is Euryops abrotanifolius, common but quite charming. Next is the Heterolepis alien, the rock daisy with it’s distinctive sparsely toothed grey leaves. If these are all looking the same you can understand why the identification is a challenge. There are two more that I have not identified and I will ask the ispot group to help me with them and report back. For several weeks now I’ve been wondering why I haven’t written a blog. After all I’ve been running on the mountain, in fact my fitness is pretty good. 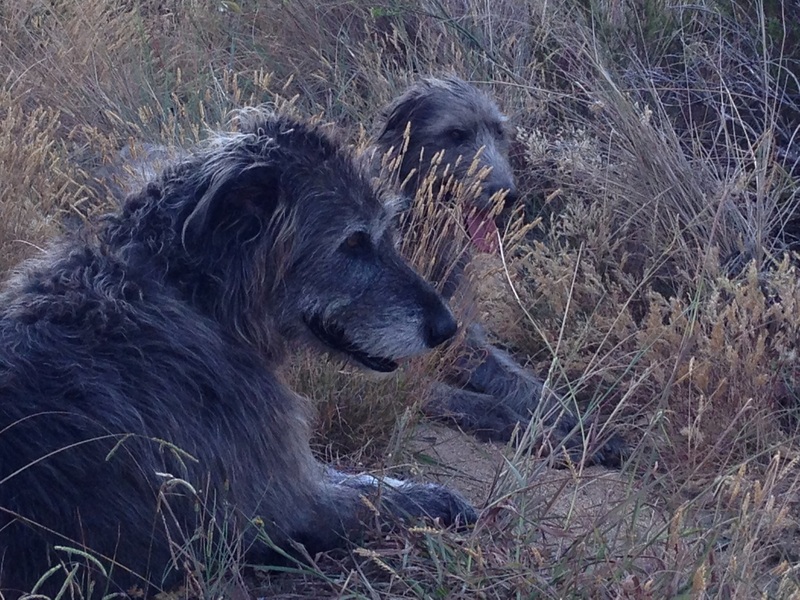 The dogs and I have had several splendid morning and evening runs. The weather is fabulous for us – this has been the coolest summer we’ve spent on the farm and dogs and humans have relished it. We love the sun, but extremes, often as high as 40 degrees, can be harsh. I did go to Europe for work a couple of weeks ago – to a freezing cold and rather depressing Paris, a city I dearly love but which was in mourning not only for Charlie Hebdo but for the loss of freedom that accompanies terrorism. The weather was as bleak as the mood although a cancelled meeting meant some rewarding shopping and one or two excellent dinners helped cheer me up. So why no blog? The question resolved itself yesterday when I was running on the top road. At this time of year the flowers die back – the middle of summer here is like the winter elsewhere, with little new growth. The point of this blog is to share the amazing beauty and variety of flowers that grow here on the farm. And the flowers hide from the heat and the harsh sunlight. Then yesterday I saw a splendid flash of pink at my feet. An Erica had burst into flower. Of course there are 660 fynbos subspecies of Erica, so they are not always easy to identify, and lots of them have pretty pink bells like this one. Given the season and the dark pink flowers this could be Erica pulchella. Tiny and absolutely lovely. The other flower that is in full bloom is this yellow pea called Aspalathus divaricata Subs divaricata (Franschhoek form). A long name to describe a pretty rambling Cape Gorse that flowers in the driest period of the year. Although there are few flowers, there is plenty of life stirring and getting going. The Leucadendron salignum which lights up the mountain on dark winter days with it’s lime green colour is putting out new reddish pink growth at the moment. And the Protea repens, the most common Protea on the farm, are covered in sticky buds, just about to flower – indeed the very first flowers have just emerged. Could it be a sign of early rains to come? They always flower before the first rains. We had a cloudy morning the other day – it’s rare and pleasant at this time of year, and the new growth coloured the mountain. Then there are the shining grasses. As we drive down the road in the evening the light floods the new vines planted just below our neighbours house and the grasses literally dazzle the eye in pink and white. I sent this photo to our neighbour and she commented that “they shouldn’t be there” so I daresay that next year the grass will be cleared and this extraordinary display of light will disapear. For the next few months these shining grasses line the roads and catch the light in a display of pink and white luminosity; I absolutely love them. Other excitement included the dogs putting up a tiny duiker who shot up the mountain and then ducked behind a buchu plant. The girls were giving chase and didn’t even glance at its hiding place and I pretended to see nothing and continued up the mountain. Not long afterwards the girls were still gamboling in the lands and a glossy chestnut coloured rhebok jumped out in front of us. Seamus was just ahead of me, but supervising the girls and although she was only a couple of feet from him, she looked at us in astonishment and leapt for cover so quickly that he didn’t even see her. Or pretended not to. So much for being a sighthound. The sunsets are often incredible. 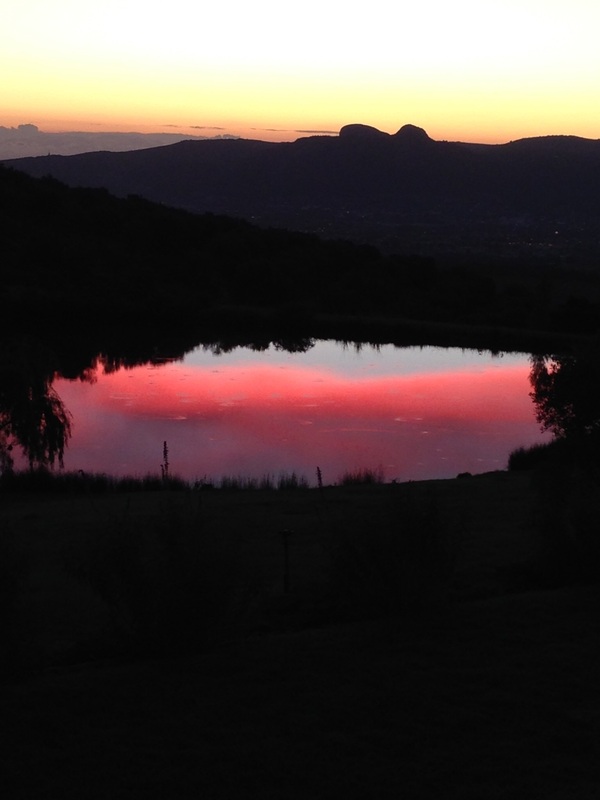 On that cloudy day the dying rays caught the cloud above the dam and turned it perfectly pink, which was then reflected in the water, a perfect end to another wonderful day at home in Africa. Christmas and a house full of family and friends. Running on the mountain continues with a bride (Peter’s son gets married on 8 Jan and they are staying with us) who is keen to keep her figure elegant through the Christmas indulgence so the running is serious and the opportunities to stop and take pictures infrequent at best. We’ve been running through the pine forest that adjoins the farm; in the warm summer weather the stately silence of the trees and the dappled cool of the forest is a welcome break from the heat and the wind. Because the dogs get protective I tend not to run in the forest except on Sunday mornings and at Christmas when the foresters take a break. We did a farm run for a change this morning and saw this Tritoniopsis burchellii; the guests were good enough to wait while I snapped it. I’ve been waiting for it to flower – I first saw it last year about this time. They are an incredible shade of scarlet that seems almost surreal on this photo. The Salvia africana is also in full bloom on the mountain – it flowers beautifully all year round and I can never resist taking a shot of it when the light is good. After I posted the Gladiolus liliaceus before Christmas quite a few more came out above the waterfall and we went back up to take some photos of better flowers. Peter came with me once again, the dogs followed. We spent a happy half an hour finding the best flowers. I took a shot of the same flower in the morning to show how remarkably they open up in the evening light. The dogs of course take great delight in watching our antics. It’s a funny time of year this. We love it, there are great friends who come to stay and family as well. The house is full of noise and this year, Peter’s first grandchild. There is a tinge of sadness as well. Most of the precious people I’ve lost have gone between the middle of December and the end of January. It’s a well known phenomenon that people pass away at Christmas, for many reasons and all of them different. So in the celebration and coming together there is also sadness, regret and reflective moments. Loss. These days are busy and full of treats and fun. 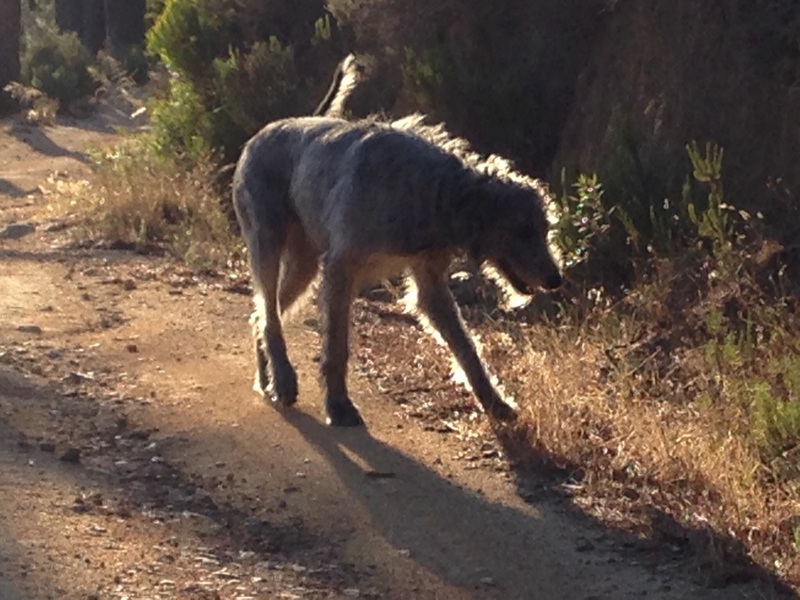 As we run on the mountain with the dogs bounding after Ola who bounces along ahead like the resident klipspringers, tiny antelopes with spongy feet that allow them to spring across the rocks, I follow and in the beauty of these mountains I think of those who have departed, and quietly remember them. Not always sadly; there is pleasure in the memories, they are gone but they were wonderful and we were lucky to have known them. I reached a target today. This weekend I’m riding in a competition and I really wanted to lose the extra couple of kilos before the show. I weighed myself this morning. Wow, I actually made my target! And as I was out running this morning it occurred to me that I’ve never talked about diet. Or, let’s call a spade a spade, dieting. This blog is about the run and the flowers. But why run at all? I saw a brilliant ad once, for Reebok shoes called “Belly gonna get you!” A man was chased around New York city by the fat belly he’d have if he didn’t run. That’s why I run; I’m afraid that belly will get me. I run away from the fat person I don’t want to be. The trouble is, I like to eat. Not in an unconsidered full fat sugar chocolate driven way, more a fine dining, excellent and delicious food kind of way. And as Peter said when I mentioned that his daughter complains that we don’t keep treats in the house, “our treats come in bottles”. Perhaps it’s time for a flower, captured on this morning’s run, before I continue this little dietary indulgence. This is an absolute favourite, if only for its splendid name. Not the best photos, they were captured early this morning and I was more focused on the run and my thoughts about weight and fat than flowers. There will be a few of them to come all over the farm and I’ll capture a better shot of this lily named Wachendorfia paniculata. Back to the diet. All my life I have struggled. My family, on both sides, survived the Irish Famine in the mid-19th century for a reason. If we were horses we’d be called good doers. We do terribly well on terribly little. Most of my cousins have struggled as I have. If you stop the struggle, woah, clothes sizes accumulate with terrifying speed. So I run away from the fat person I don’t want to be. And as I was running away down the drive this morning I couldn’t resist a shot of this Leucospermum lineare, the Vulnerable, from a baby plant on the drive. 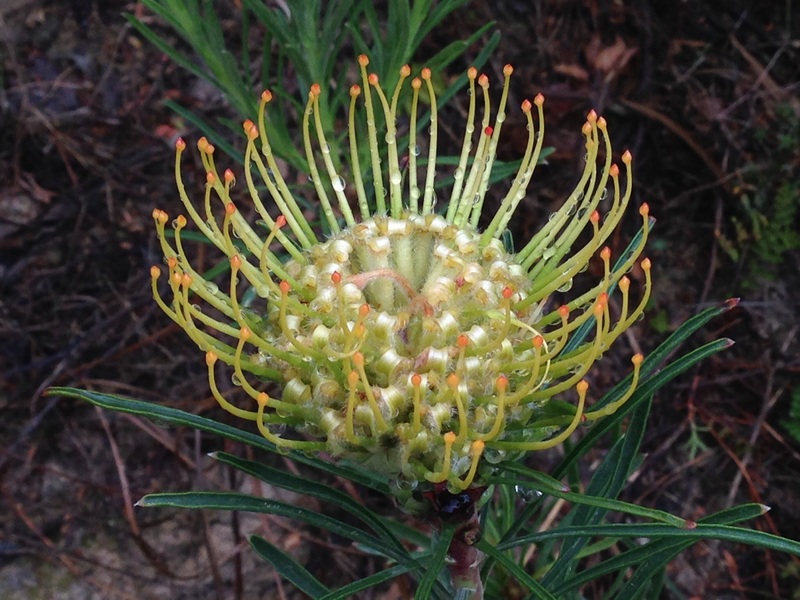 This endangered and quite rare member of the protea family is thriving here on the farm. Here in Cape Town everyone is Banting. This is the name a doctor called Tim Noakes has given his diet which is a kind of super-powered Atkins. High fat, medium protein, very low carb. I think it’s rather revolting but I do have to admit that people who stick to it, really stick to it, religiously stick to it, do lose weight. Some of them have got quite thin. But as he says in his book, if you don’t stick to it, you’ll balloon. Now I’ve tried most diets; I really mean that, you name it I’ve done it; a lifetime of diets. It’s been my constant, rather boring obsession. But one thing I know is that if I’m required to cut out major food groups, I’m not happy. I might lose weight, but I’m not happy. I can tell you from experience that the best diet is abject misery, really proper, grieving kind of misery, like after a break up, or when someone you adore dies. That’s no way to live but unfortunately being happy makes you fat. I believe certain drugs can be fabulous, but again, not a way to live. Smoking was marvellous, but… once again, not a great option for life and I gave it, and control over my weight up when I was 28. I put on that stone that I’ve never really lost. I’ve lost weight on Weightwatchers and on the Dukan diet, but not really on any other, until now. Running is great for controlling weight, but not so much for losing it. Every holiday, every time I travel on business, a sneaky kilo or two is gained and oh, the dread of getting it off. Yet I’m not interested in never having another slice of bread, never baking a cake again, never eating an amazing dinner, all five courses, with absolute pleasure. And I do like a vodka and soda with a splash of Campari after a long day as I make dinner, usually a very healthy dinner during the course of a normal week. And a glass of wine, or two. So I run. Three times a week, pretty much every week. Sometimes four times. If I run at the weekend I’ll do 5K or 6K, but otherwise it’s 4K. And I do Pilates twice a week. Vainly hoping that I may have my cake and eat it too, with a glass of champagne. Worrying about my weight has probably occupied more of my waking hours than any other single subject. You’d think that all that worry would mean I’d take control and just eat less, but it doesn’t seem to work like that. Those famine genes want feeding, but the famine’s over, so delicious things preferred, please. In August 2013 I picked up a book, rather randomly, in an airport and read it on the plane. A colleague I’d been working with in Qatar was looking fantastic and told me about this diet. It is called 5:2 and I immediately knew it was for me. The logic is divinely simple. Two days a week you eat 500 calories, that’s 2000 kilojoules. The rest of the time you eat normally. And where before you might slightly overeat on a weekly basis and gradually gain weight, by cutting out 1500 – 2000 calories a week, every week, you gradually lose weight. I’ve always found it easy not to eat for a day, it’s following dietary restrictions day after day after day that I struggle with, especially with a lifestyle where we travel a lot, socialise a good bit and love to eat out. Never mind the “treats in a bottle”. The book also described huge health benefits that the diet provides – when your body doesn’t have to worry about digesting food, it finds all sorts of useful repair jobs to do instead. Intermittent fasting turns out to be amazingly good for you. Peter doesn’t do it with me and is kind enough to fend for himself on my “2” days. He doesn’t love it, but he loves the result. It works. I haven’t become skinny but my average has come down. It’s not a totally steady loss. The closest way I can describe it is if you look at a one year chart of the FTSE, the London Stock Exchange. Take out the big plunge this October and that’s been my dieting year. In line with the FTSE, except we want the FTSE to go up and the weight to go down! The point is, the peaks don’t go up and up and the control has been stable. A trip, or a heavy social agenda, a kilo creeps on here and there. With the regular “2” days, once normal eating and exercise are established, off it comes. If I make a bit more effort, it comes off quite easily, never quickly, about 250g to 500g a week. But off it does come. And I don’t have to think about it. Just do it. It took me a while to get used to eating so little so little in a day, but now I enjoy it – I just don’t have to think about food. As for being hungry, that’s ok, for a day. Tomorrow I can have what I want. It’s no longer a diet, it’s a way of life. I’ve told all my friends about this wonderful diet and only one has really got it, loves it and does it as a habit as do I. I don’t know why, everyone wants to lose, or at least control their weight, and this is the easiest, most pain free way I’ve ever found that achieves just that. We went out one evening this week to run up the mountain and saw the glory of another sunset. The light in the olive groves, the view of the sun setting behind Paarl Rock with Table Mountain in the background. I may only be running away from my genes but at least I get to run here, on the mountain, with the wolfhounds, in the glory of the light. Spring is turning into summer on the mountain and the wind is howling at night and most of the day. There is an afternoon lull but already, at 7 o’clock in the evening, I can hear it picking up outside the office and later it will whip around the house and rattle the roof. I spent the weekend in George, along the famous Garden Route at a Horse Trials, the Western Province Championships. We had fun, didn’t win any big prizes, but spent the weekend with our friends and got to gallop fast over solid fences which is the most fun you can have on a horse. On Friday morning I went for a run in the suburbs of George and enjoyed sightings of fynbos flowers that have adapted to the urban environment. Here on the farm I know only of one place where the Gladiolus maculatus blooms and that’s in July. Looking at the book I see they are winter flowering but I saw them, or something very similar, in a spot of suburban wasteland as I ran past. Perhaps I should have taken a closer look. When I don’t take them running often enough the dogs get bored and take themselves off for their own runs. Sometimes they are gone for hours and we get increasingly worried about them until they come home, panting and joyful, terribly pleased with themselves and usually soaking wet as they’ve stopped for a cooldown in the dam on the way back to the house. Several dogs have disappeared on the mountain that we know of and we worry and worry when they are gone, we go looking for them and calling them for hours and never see a sign. Last time I checked there was no tracker available that would work here in South Africa but recently I heard of one, so I searched again and found it in Germany. It arrived today and has now been attached to Maebh. She and Jemima Chew often go for a quick hunt in the evening, and sometimes Maebh and Seamus go off together, but for some reason, never the three together. If Maebh has a tracker, we’ll know where to find them. I know better than to think I will get any photos in this wild wind, but I’ll see what’s there and where to go when the wind drops. They say in Cape Town that if you don’t like the weather today, don’t worry because it will be different tomorrow and the change in weather is heralded by the wind dropping to that incredible stillness on the mountain that I’ve so often written about. When that happens we will pick a moment of good light to catch the latest spring flowers. In the meantime there is much to catch up on. Last year I failed to name this blue flower so I posted it on ispot. The experts suggest it might be Aspalathus cephalotes subspecies obscuriflora. Another pretty thing I couldn’t identify is this white “flower” which is tiny and turns out to be the seedhead of Ursinia anthemoides which I photographed in August but hadn’t posted, much more interesting to post the two together now. I love these fluffy heads that must be Stilbe, I think vestita. The other fluffy flowers that I photographed some time ago and never posted are the wild buchu plants that grow on the farm. Our crop is buchu, Agathomsa crenulata and hybrids thereof, and Agathomsa betulina. These are used medicinally and in the food flavouring and perfume industries because of the powerful essential oils that have an intense note of blackcurrant. I occassionally post photos of the buchu we farm which is indigenous to the area. This is a genuinely wild buchu, probably either Agathomsa imbricata or capensis. As I was running down one of the roads I noticed that it was bordered by shrubs of Salvia africana all in flower and would make a wonderful photo. Being in a hurry I put it off only to find when I returned that a spring wind had blown the flowers to shreds. They are tough and they flower all year but the best display is in a wet spring. They are stalwart friends on the mountain with an exceptional colour and fortunately enough remained for me to capture some of the flowers. Summer is Helichrysum season and it begins with this Helichrysum patulum. We have several subspecies of this wonderful and resilient plant on the farm and they deserve a page of their own. 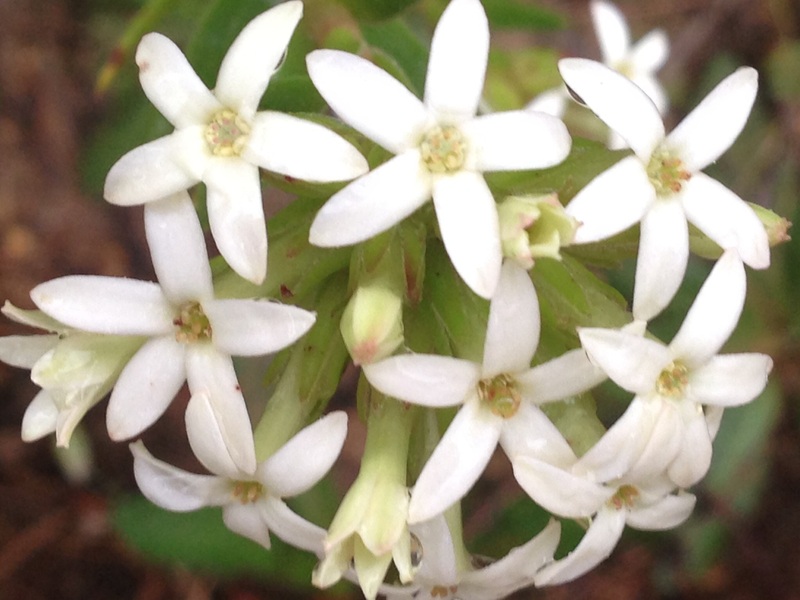 Along the drive the Crassula fascicularis has come into flower. Finally, one of my top favourite flowers has emerged, the lovely spikes of Aristea capitata, unmistakable and one of the first flowers I identified when we bought the farm and I started running here. These are prolific in damp areas and I hope they will be spectacular this year after the wet winter. We’ll have more photos of them over the next month. What a welcome home. We arrived back from a 10 day trip from Europe and for once it was a holiday and not work, so instead of feeling shattered and grumpy we arrived to a perfectly glorious spring day, full of joy and looking forward to getting home to the farm and the dogs. This evening, at sunset, I put on the running shoes and went out onto the mountain with the dogs. Since we left it has poured with rain; it must have been one of the wettest August’s ever which might be a bit miserable but produces perfect conditions for the fynbos to flower. The mountain has exploded into life since we left and we are in for a bonanza season. Any reader of The Fynbos Blog who would like to visit the farm and do a ‘flower safari’ is welcome to contact us and we will welcome you. We are in Paarl, the best time of day is sunset in good weather, though mornings are also good if we have time. You must like dogs. Tonight the sky was glorious with colour and for once I’ve posted a sunset shot as the headline picture. All the photos on this blog are taken with my iPhone 5 and I’m so impressed with what it can do. This shot is a view of the lights of Paarl, with Table Mountain 60 kilometres away dominating the skyline in the orange light. Peter had been up to the weir earlier today and he took the new road by the waterfall. As we set off he told me it was covered with tiny white flowers and we ran up that way to find the road, and indeed much of the farm covered with Hespertha and Geissorhiza ovate, they can look quite similar in a photo but are quite different in real life. Another common flowering bulb in the lands at the moment is the Grass lily, Chlorophytum – I’m not quite sure which subspecies this one is. When the plants are strong it looks like a tiny tree growing from the lily-like leaves. There are so many flowers at this time of year that it can be a struggle to comment on each of them. Being on the mountain is amazing; it is covered in flowers; I post only the new things I see, or if I get a particularly lovely shot of an old friend. I’ll group all the flowering bulbs together, they are always particularly lovely, and shrubs, daisies and so on separately. This is today’s collection – not all of which I have identified yet. Delicate, tumbling down the slopes beside the drive, the Vulnerable as Lucospermum lineare is known, is one of the sights of winter and early spring. It is rare and endangered and safe with us. What a weekend! Why do we think: let’s do a dinner party on Thursday, and then, yes, another one on Friday, leftovers on Saturday but oh my goodness a long long Sunday lunch at the gorgeous and delicious Overture Restaurant in the Hidden Valley where we plumbed the depths, the deepest depths, of their wine cellar? And got home at 9pm. From lunch. Personally I blame the wonderful and very talented Niall who has been here coaching dressage and who likes the good life just as much as we all do and is thoroughly good company, so everybody wants to spend time with him when he’s here and we like to entertain him. So I didn’t get out on the farm this morning, but I managed to stagger out with the dogs for a lovely time on Saturday afternoon which was much more about the flowers than the running. The Babinia fragrans are all over the place now – one of the prettiest and commonest flowering bulbs on the farm. Once they flower everything else seems to start bursting with life. 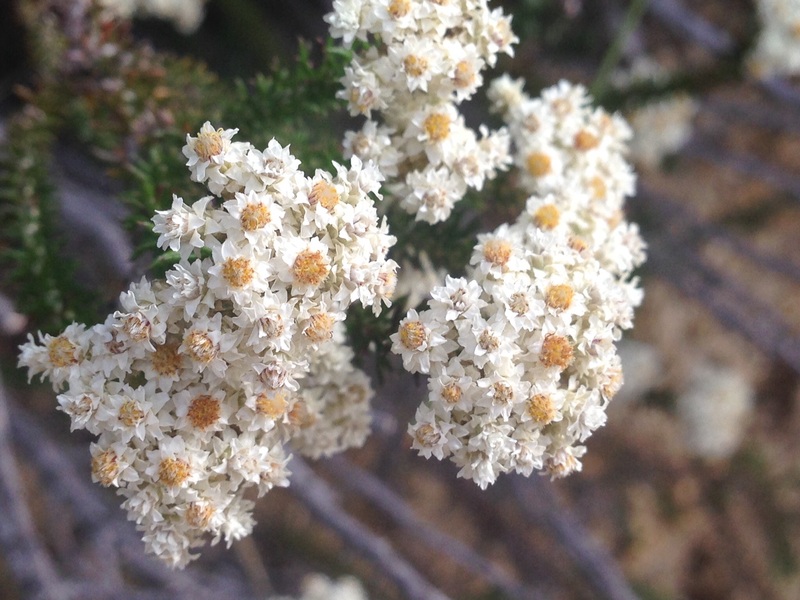 On the drive, growing now among the Morea tripelata is a delicate little flower which I have not identified. And talking of Morea, as we ran down the path to the waterfall I saw this, which made me stop and look twice. It looks very like an oxalis, but the colour is darker than most, the leaf not the same and it lacks the common yellow throat. Also, the Oxalis petals grow in an Escher-like (would that be Escherian?) spiral, where this has three top petals and three bottom petals. As I flicked though the Encyclopedia of bulbs I suddenly recognised it – Morea veriscolor. Lovely to find something new and learn a new flower as well. We stopped for a drink of course and Seamus took his usual spot in the stream, peeking at us through the ferns. All over the farm and probably all over the country the tickberry is in flower. This is one of those plants that has been renamed – it used to be known as Chrysanthemoides monilifera but now has been reclassified as Osteospermum moniliferum. It grows wild all over South Africa and is found in lots of gardens as well. Another very common shrub is known as the climber’s friend, cliffortia ruscifolia. Quite a stocky and strong rooted shrub, which must be why it is known as the climber’s friend, it certainly can’t be much fun to have to grab these brutal prickles. We’ve cleared lots of lands over the winter and although I always worry about how much fynbos we take off it creates room for new growth. The iPhone does a brilliant job of photographing flowers but not the delicate massed scattering of daisies and Babinia fragens in a field of buchu. At the top of the field are masses of little yellow daisies. I couldn’t find them in the book until I realised that the buttonwood daisy can have yellow petals as well as white. This is not a great photo of this tiny flower as the light was hot and yellow. Just at the top of the waterfall a single Red Hot Poker, Knophofia uvaria has emerged. And along the road I saw this flower that I didn’t recognise at all but it was on the first page that I opened in one of my books. It is Metalasia divergens. And one last flower seen on this run. I’ve spotted some new Pelargoniums that I don’t think I’ve documented before and we’ll be off in the morning if the light is good to see if we can get some shots of them. Meanwhile this pretty Erica is different from all the others I’ve documented so far this year. Pretty soft grey leaves distinguish it from others, as does the slightly different shape of the pink bells. It’s gorgeous.